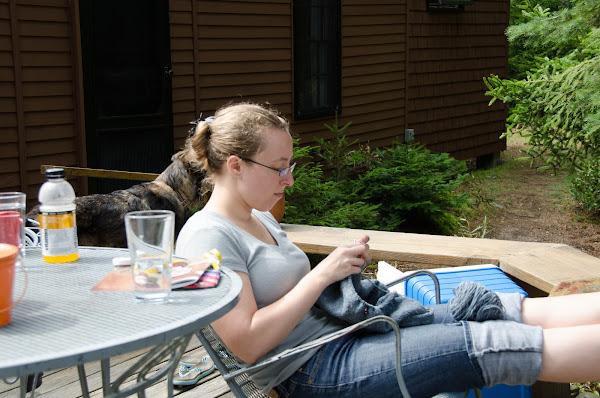 That’s right: I sat on the porch and knitted all week. You totally didn’t expect that, did you. I worked on Seneca, a cabled sweater pattern by Jared Flood, using Shelter yarn (by the same Jared Flood!). Honestly, I’m surprised that no one (on Ravelry, at least) has yet knit this sweater with this yarn—it seems like a natural combination for Brooklyn Tweed lovers. I swore and swore I would never knit with Shelter, but this pattern really grabbed me and once I saw Shelter’s Faded Quilt colorway I couldn’t imagine this sweater in anything else. But, wait: why had I sworn off of Shelter? Everyone knows Jared Flood is a god and we want everything he’s had a hand in, right? Well, I met him once briefly and I can tell you he’s a very nice young man, a wonderful photographer and (from what I hear) a great teacher. 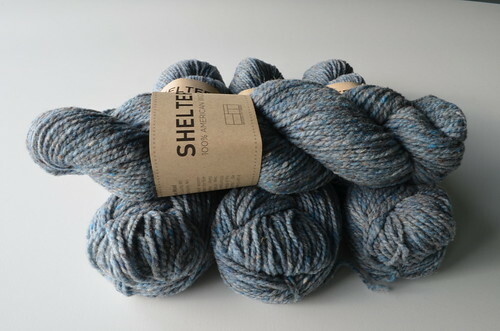 But Shelter is a pretty rough and rustic yarn—not usually my style—and friends who’ve knit with it reported that it’s got a lot of vegetable matter in it (hay, grass, etc.). One even had to wear a Band-Aid on her tensioning finger while knitting because the yarn + hay was so abrasive. Given that, and the fact that Shelter isn’t cheap, I figured I could mark it off my list. There’s a whole lot of other yarns in the world, right? But like I said, the color really got me, so I decided to give it a try. After going through six skeins, what do I think? Well, if I were designing a (tongue-in-cheek) marketing campaign for it, its slogan might be “Shelter: free hay in every skein!” or “Homely yarn at a luxury price!” I literally ended up carrying a pair of tweezers around with my yarn all week so that I could pick out all the grass and guard hairs. There was so much that I even started recognizing different types of plants—the wide grasses, the small dried flowers—and developing strategies for picking them out (the flowers come out easiest if you pull them down by their stem, not up by their flower bud). That seems like an excessive amount, right?? I may be being overly snarky, but my summary is this: if the whole grown-and-spun-in-America thing is important to you, buy this yarn. If you want to support an independent yarn artist, buy this yarn. If you fall in love with it for some random reason (like you absolutely have to have the Faded Quilt blue), by all means buy this yarn. But if you’re just looking for something sturdy, comfy, and high-quality to knit with, I think there are many yarns out there that beat Shelter in each of those categories, if not all three at once. Take, for example, Blue Moon Fiber Arts’ Targhee Worsted, which is also grown and milled in the US and sold by an independent dyer, but costs only $32.00 for 616 yards (Shelter costs $55 for the same yardage). The view from our cabin in Maine. Thank you for speaking the truth about this yarn. I also live in the Seattle area and was an “early adopter” once it hit Churchmouse. I can’t figure out what the hype is. I wouldn’t want this yarn close to my skin, nor is it particularly comfortable to knit with. Jared is all of those wonderful things you mentioned about him, but I guess I just don’t understand the direction he’s going with his yarn. 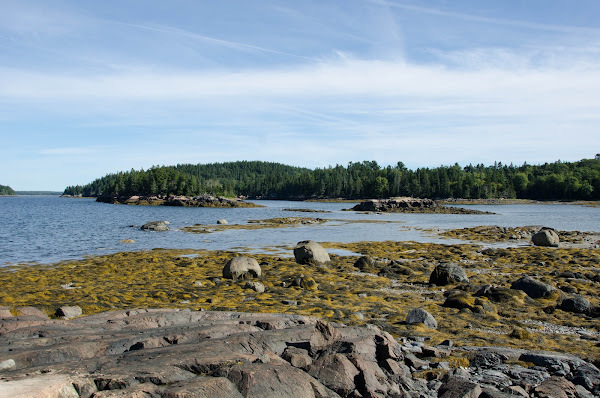 I was in Maine the weekend of Sept. 20! The weather was fantastic and I spent the time learning how to knit a sweater that fits me! Sounds like we both had an amazing time!